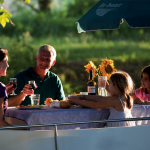 Le Boat is offering up to a 10% discount when you travel with children for seven nights or more. 10% offer up to 28th Feb for cruises commencing in July or August, 5% in other months of travel. Children love Le Boat with the adventure of visiting a new destination each day. Of course there are parks playgrounds, museums and outdoor swimming pools all along our routes. A cruise along this section of the famous Canal du Midi takes you through sun-drenched countryside and medieval towns and villages. Set high up on a hill, Carcassonne’s ancient walled city is Disneyworld-perfect. This fairytale collection of drawbridges, towers and atmospheric cobbled streets was reputedly the inspiration for Walt Disney’s The Sleeping Beauty and is perfect for a day of family medieval exploration. Plus, don’t miss a wine-tasting adventure with a difference. Burrow down deep beneath the Corbière massif. At 80 metres below ground, the Terra Vinea tour includes cellars containing hundreds of oak barrels, a small underground lake and a sound and light show. Part of the tour take place on board a small train, which the children will love! Prices start at $AUD4,299 for a 7 night cruise including the discount, based on our new Horizon 2 cabin cruiser. The famous River Thames winds its way around countless parks and picnic spots, such as Pangbourne Meadows, excellent places to moor up and have a picnic, enjoy a game of cricket and generally let off steam. For an action packed day of family fun, Thorpe Park will entertain with plenty of white-knuckle excitement and Legoland will captivate the younger ones with lots of fantastical fun. A day at Beale Park offers a unique collection of rare and endangered birds, an owlery and animal favourites including monkeys and meerkats, a choice of several adventure play areas and a narrow gauge diesel railway. 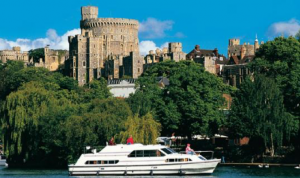 Just a tube ride away is an exciting day exploring England’s famous capital city. Take a flight on the London Eye, see the Crown Jewels at the Tower of London and have some spooky fun at the London Dungeons. Prices start at $AUD3,899 for 7 nights in July including the discount, based on our new Horizon 2 cabin cruiser. The trendy and breathtaking region of Alsace Lorraine is perfect place for the kids to appreciate the great outdoors, with a good mix of modern-day excitement thrown in. The Arzviller boat lift, a marvel of modern engineering, is an unforgettable experience and will be a highlight of their holiday. A gigantic trough lifts/descends boats by 45 metres. Stop in Strasbourg for a unique and vibrant atmosphere. This cosmopolitan city is great for shopping, sightseeing and excellent restaurants. Make sure not to miss Europa Park, a short distance from our base at Boofzheim and Germany’s biggest theme park providing a sensational mix of adventure, entertainment and white-knuckle thrills. The 85-hectare grounds are divided into themed lands, 13 of which feature the architecture, food and flora of a particular European region. Prices start at $AUD4,599 for a 7 night cruise including the discount, based on our new Horizon 2 cabin cruiser. 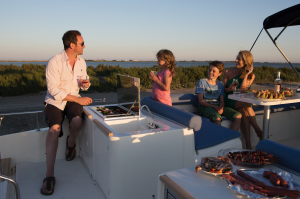 For a perfect mixture of seaside fun, cruising and Mediterranean sunshine, the Camargue is our number one choice for families. The Canal du Rhône à Sète runs parallel to the Mediterraean coast and the beaches are great for kids – they are large so there’s no real risk of over-crowding. Many of them have lots of shops and restaurants and fun-fair amusements to keep kids occupied once they’ve had enough of swimming. Visit Les Rochers de Maguelone in Villeneuve-lès-Maguelone for a full day of activity with its 22 aerial tracks. Equipped with a harness and attached with a system of ropes and karabiners you walk on ropes, ladders, swing bridges and planks through the trees. Prices start at $AUD4,399 for a 7 night cruise in July including the discount based on our new Horizon 2 cabin cruiser.